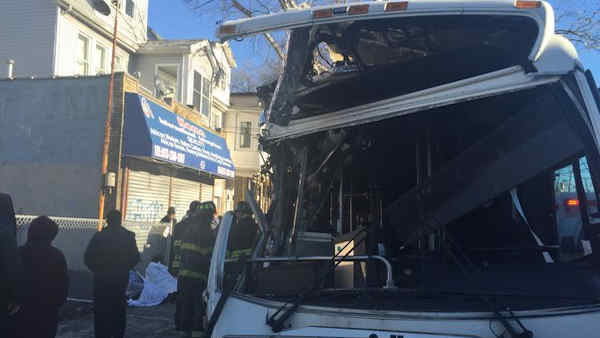 NEWARK (WABC) -- A New Jersey Transit bus crashed in Newark Monday afternoon, injuring 31 people. NJ Transit says the #37 Line bus was traveling from Newark Airport to Ivy Hill when it hit a tree at the intersection of Wainwright Street and Lyons Avenue. Newark police and EMS responded to the scene, and investigators are trying to determine why the bus swerved off the road. The crash sent passengers into a frenzy, and many of them jumped out of windows and the back exit over fears of a possible fire. Officials described 12 of the injuries as minor, and another 17 as non life-threatening. The two other victims reportedly suffered broken legs and were rushed to area hospitals.